The preparation course for the Cambridge ESOL teacher training exam, the Certificate in English Language Teaching to Adults (CELTA), the most popular teacher training qualification. The CELTA Course is a fully comprehensive CELTA preparation course so that trainers and trainees have all the material they need. The course is written in collaboration with Cambridge ESOL so trainers and trainees can be sure the content is appropriate. The Trainee Book provides CELTA candidates with both a helpful reference during training, and a permanent record for use after the course. 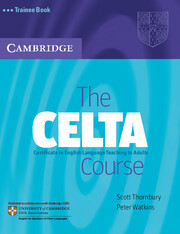 The Trainer's Manual and Trainee Book offer course providers a ready-to-use CELTA course.